Easy! Weekly Meal Plan on a Budget in 4 Simple Steps! Looking for a cheap and healthy meal plan that will help you reach your clean eating goals without breaking the bank? Join the club. While the idea of eating clean sounds so simple to implement, it’s actually pretty challenging to stick to a weekly meal plan on a budget. With so many temptations at our disposal, it’s surprisingly difficult to cut sweets, alcohol, and refined grains out of our diets completely, and when we do give in and enjoy something glutinous, we have a tendency to get carried away. I’ve tried heaps of different fad diets and workout regimes over the years to help me stay in control of my weight, and while I’ve had varying degrees of success with each thing I’ve tried, experience has taught me time and again that meal planning is the only way I can stay on top of my clean eating goals. When you eat clean, you increase your intake of whole foods such as vegetables, lean protein, and healthy fats, and you decrease your consumption of things like added sugar, alcohol, and refined grains. And when you look at it that way, clean eating seems like a no-brainer, right? So why is it so damn hard?! It’s because we’re too busy. We live in a day and age where we GO! GO! GO! all day long, and despite our best intentions to eat healthy and workout, we simply do not have the time. At least, that’s what we keep telling ourselves. But the reality is that we DO have the time. We just choose not to make our eating habits a priority. And we have no one to blame for those extra pounds we’re carrying around with us except ourselves. It’s NEVER too late to make changes, and today I’m going to share some tips I use to create a weekly meal plan on a budget so you can stop making excuses for your crappy eating habits, and then I’m going to tell you how I make 10 meals in under an hour for less than $100 in groceries. The best way to create a weekly meal plan on a budget is to plan your meals at least a week in advance so you aren’t spending every waking moment at the grocery store. By creating a weekly shopping list – and sticking to it! – you will be armed with a plan of action when you go food shopping, leaving you less likely to pile a bunch of junk food into your cart. And when your pantry and fridge are stocked with healthy foods, your options become clean eating…or clean eating. It doesn’t get more simple than that! Visiting a grocery store on an empty stomach, or even a half-empty stomach, is like setting a 5-year-old free in a candy store. You end up getting distracted by things you don’t need, making you more likely to make impulse purchases and bad food choices. It’s a recipe for disaster. While the convenience of preparing the same, simple meals over and over again can seem tempting when you’re short on time, it’s important to keep your weekly menus interesting so you don’t get bored and abandon your meal planning efforts completely. Invest in a few cookbooks, swap recipes with a friend, do some research online, and make it a point to try a couple of new dishes each week to keep things interesting. Set aside a chunk of time to prepare your meals for the week. I prefer to do this after lunch on Sundays when everyone is fed and content to do their own thing for a couple of hours while I listen to 90s music while stocking our freezer with as many ‘heat and eat’ meals as possible. Did I just hear you complain that freezer cooking is too time consuming and difficult? Well, I have news for you my friend. I actually hate cooking, but when I was struggling to keep my head above water late last year, I spent some time evaluating where I was spending the bulk of my time each day, and I was shocked at just how long I spent in the kitchen. My first idea was to sign-up with a meal prep company, but we’re a family with various food allergies and I eventually came to accept the fact that ordering our meals wasn’t going to happen, and went back to the drawing board. And that’s when I found out about MyFreezEasy meal plans. Have you heard of MyFreezEasy? It’s a simple solution to meal planning that has totally changed my life (and waistline). Once you sign up, you’ll receive 8 new freezer meal plans each month, and then all you have to do is download the recipes, shopping lists, and step-by-step meal assembly instructions, and Erin will show you how to make 10 freezer-friendly recipes in under an hour. Oh, and did I mention there are tons of different meals you can choose from? You can even build your own menu, and MyFreezEasy has an app so you can plan your meals and access your shopping lists when you’re on the go. 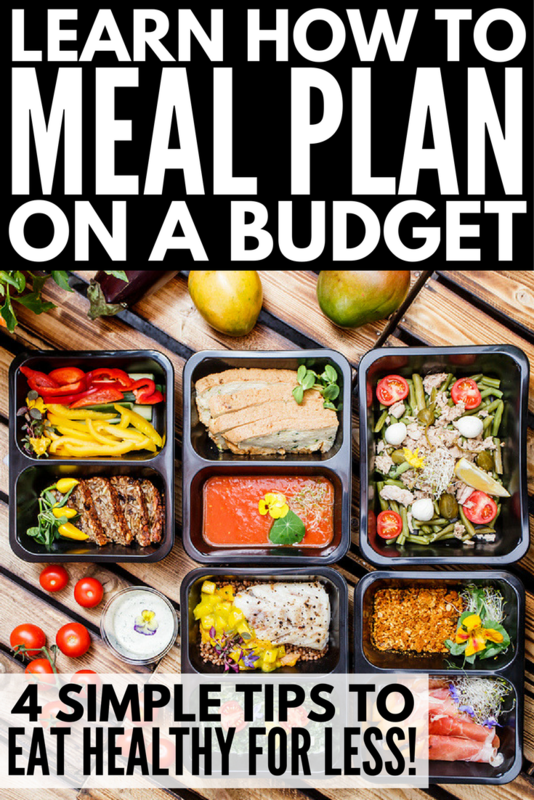 If you are serious about creating a weekly meal plan on a budget so you can eat clean and get back in shape before swimsuit season, you officially have NO EXCUSES. In less than 4 hours – an hour to plan out your meals, an hour to grocery shop, and less than 2 hours to prep and cook and clean up – you can have 10 healthy, heat and eat meals to enjoy on crazy weeknights when you’re too tired to cook. And if you do it right, it shouldn’t cost you more than $100. Sign-up for MyFreezEasy here and say YES to creating a weekly meal plan on a budget! If you found these tips to create a weekly meal plan on a budget helpful, please share them on Pinterest! And if you’re looking for more health-related tips and tricks, please follow our Health board where we share all kinds of fabulousness!